Firstly, let me say a huge, big THANK YOU to everyone who has checked out my blog or followed me this week! My friend over at Knitter Nerd said many nice things about me, and now the pressure is on to live up to them! Thanks Polo for sharing my blog and posts, and I wish you so much luck with the Knitter Nerd re-launch! Please make sure you check out her amazing blog, if you haven’t already! As Polo mentioned, I work at a small community museum in my hometown, and I am a complete history junkie. My love for history has crept its way into my knitting addiction, and I have recreated two patterns found in Godey’s magazine: my Sontag and the Sortie Cap, both patterns dating to the mid-1800s. For special events, I get to dress like a Victorian, and these knits complement my costume very nicely. I’ve perused other Godey’s magazines, that conveniently have been digitized and are available for searching online, and I have other patterns I’d like to make, but I have a feeling they will be a project for me in the new year, you know, after the holiday knits are complete! My first historic knit came from a pattern not nearly as old as the Godey projects, but the pattern is 100 years old. Simply titled ‘Directions For Making Socks,’ this pattern was found in the Ontario Reformer in 1915, with the intention of promoting making socks for soldiers who were fighting overseas in World War I. After tackling only one pair of socks previously, I decided to make a pair of WWI socks in the spring of 2014. 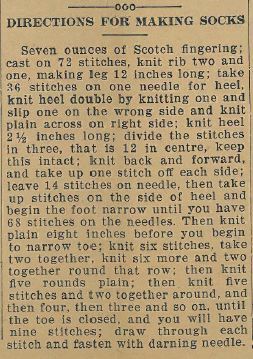 Word to the wise, when working off directions from 100 years ago, basic knowledge in sock construction is key. Thankfully, I have very helpful friends in the knit circle I attend, and they held my hand when it came to setting up and knitting the gusset, and my grandmother was very helpful when I needed confidence in following the heel turn instructions. Otherwise, it is a very simple sock with a lot of ribbing and plain knitting. The sock was quite an investment in my time, but I think if I was to make another one, it would make up much faster. My knitting has improved and I’m much faster now, but the 12 inch leg truly tried my patience! Knitting the leg along was a test to my dedication of the project! 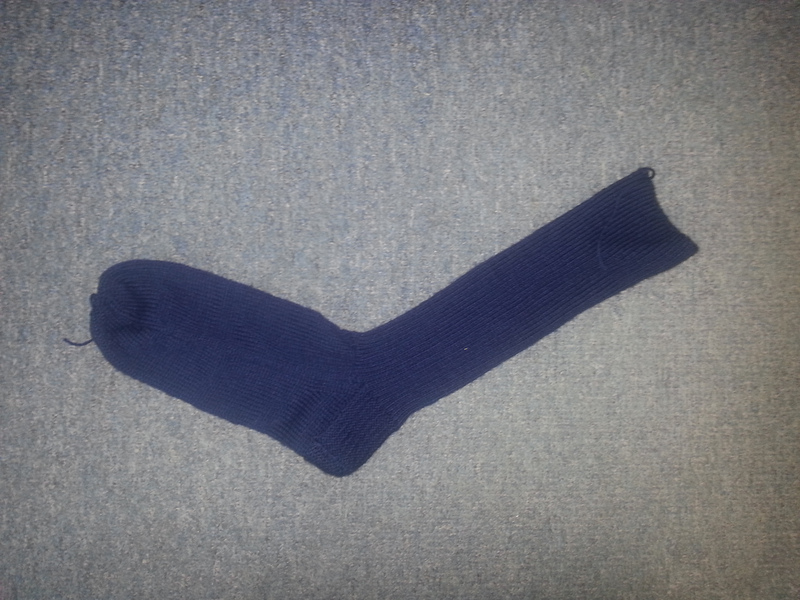 Above, I keep referring to the singular sock. I finished the first, and second sock syndrome set in… big time. Eventually, I came to the conclusion that for demonstration purposes, the museum only really needed the ONE sock, so its mate never got completed. Thankfully, the dedicated women in the 116th Knitting Society had more fortitude than I. They were a group of women who worked hard and made socks throughout the First World War which in turn were sent overseas, and the local newspaper frequently reported on their progress. As an example, in early December, it was reported that 56 pairs were sent to France. We also know that the socks were greatly appreciated by the soldiers who received them, as the newspaper once published a letter which was sent to a woman in the 116th Knitting Society, expressing his deep gratitude at receiving the simplest of gifts. The First World War was a hard war. Yes, I know this is not a fair statement as no war is ‘easy,’ but this was one of the first with trench warfare, and trench foot was a very grim reality that soldiers faced. The arrival of new socks, lovingly made by those at home, would likely have been a source of joy and relief in an otherwise grey world. Once again, many thanks to Polo, and to you readers for stopping by my little blog! I hope everyone is having a great Thanksgiving (to all of my fellow Canucks), Columbus/Indigenous Peoples’ Day (to those south of the border), or just enjoying your Monday!